The North Cheshire Rail Users Group have won many awards for the Stations it has adopted under the Arriva Trains Wales (ATW) Station adoption scheme and also under the auspices of the Association of Community Rail Partnerships (ACoRP); the Cheshire Best Kept Station Competition and also a national prize from RailTrack now Network Rail. However the Competition gets more fierce every year so its a constant effort to raise the game as more communities enter the spirit of Station adoption. This is a large four platform station; the gardens were overgrown and the size of these gardens meant that it took the group several years to bring them under control - following our attention from 1998 onwards. 1. 2000 National RailTrack Awards - Best Unstaffed Station. 2. 2003 Cheshire Best Kept Station Competition - Winner . 3. 2004 Cheshire Best Kept Station Competition - NatWest Award. 4. 2004 Westinghouse Signalling Award - The Signal Box for Best Restored Signal Box. 5. 2005 Cheshire Best Kept Station Competition - Vale Royal Borough Council Award. - Third Prize Best Station Gardens. 7. 2005 National Station of the year Competition- Small Station Category - Finalist. 8. 2006 Cheshire Best Kept Station Competition - Winner. 9. 2007 Cheshire Best Kept Station Competition - Best Kept Gardens Award. 10. 2008 Cheshire Best Kept Station Competition - Tidiest Station Award. - Arriva Trains Wales Best Station Gardens. 12. 2009 Cheshire Best Kept Station Competition - Cheshire West and Chester Award. 13. 2010 Cheshire Best Kept Station Competition - Winner. 14. 2011 Cheshire Best Kept Station Competition - Tidiest Station Award. 15. 2012 Cheshire Best Kept Station Competition - Best Kept Stations Gardens Award. 16. 2013 Cheshire Best Kept Station Competition - Roberts Bakery Award. 18. 2014 Cheshire Best Kept Station Competition - Cheshire West and Chester Award. NCRUG started working here in 2000, luckily starting work just before the platforms were due to tamaced our intervention led to the flower beds being retained and led to the glorious displays we see today. 2. 2006 Cheshire Best Kept Stations Competition - Best Kept Gardens Award. 3. 2007 Cheshire Best Kept Stations Competition -Vale Royal Borough Council Award. 4. 2008 Cheshire Best Kept Stations Competition - Cheshire Community Award. 5. 2009 Cheshire Best Kept Stations Competition - Best Kept Gardens Award. 6. 2010 Cheshire Best Kept Stations Competition - Cheshire West and Chester Award . 7. 2011 Cheshire Best Kept Stations Competition - Winner. 8. 2012 Cheshire Best Kept Stations Competition - Cheshire West and Chester Award. 9. 2013 Cheshire Best Kept Stations Competition - Cheshire Celebrates Award. 10. 2013 Won the ACoRP Award - Best new use of a station building. Runcorn East is an urban station and it has taken longer to raise the standard of the environment here but efforts by the volunteers have led to success at this modern station which has only been in existence for 25 years. 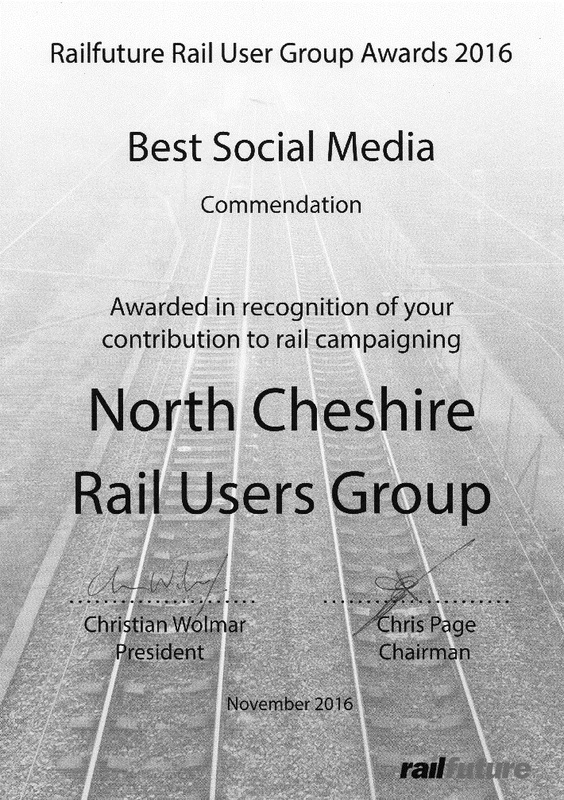 The NCRUG was awarded a "Commendation" for "Best Social Media" by "RailFuture" at its Birmingham Conference on the 12th November 2016. This award was for the video featuring "Halton Curve" and was in recognition of our contribution to rail campaigning. The award was accepted by Cedric Green Secretary of NCRUG and John Hobbs, a Committee Member and Ex-Chairman who produced it. The Video was directed by Saskia Dooley and funding for the project was provided by ACoRP and the North Cheshire Rail Users Group. Northern provided the facitities. John Hobbs thanked ACoRP for their help in funding the video which would not have been otherwise been produced and Saskia for her input and commitment to making it a success. The video features Graham Evans MP, who has lent his support to the reinstatement of Halton Curve; together with NCRUG Committee members; the line is on track to be reopened in December 2018.